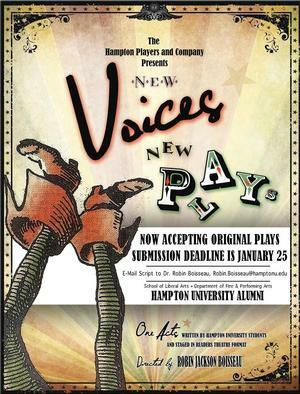 The Hampton University Department of Fine & Performing Arts is Accepting Submissions from Hampton University Alumni for Their New Plays, New Voices Playwriting Competition for the Spring 2019 Semester. HAMPTON, Va. (Jan. 17, 2019) - The Hampton Players & Company in conjunction with the Department of Fine & Performing Arts is proud to announce that it is now accepting original plays from Hampton University alumni to be presented in February 2019 as part of their “New Plays, New Voices” playwright competition. “New Plays, New Voices” is an opportunity for workshopping new works by student playwrights. The production is done in Reader’s Theatre style, with no set, minimal costumes, and actors performing an oral interpretation of the pieces. Past productions have included “Karma’s Way” by V.J. Banks, “April Fools in Love” by Torenzo Blair, “Silver Spoon” by Diamond Sydnor, “Cookies” by Veronica Maccari, and “The Smell of Paint” by Angela Reid. 1. Submissions will only be accepted from Hampton University graduates. 2. Plays may be 10 minute scripts, one-act plays, or two act plays. 3. Scripts that are accepted for production may be modified for the needs of the production. 4. Playwrights whose works are accepted for the production must sign a waiver that specifies that the Department of Fine & Performing Arts and Hampton University will have final approval of the script, may modify the script as needed for the production, and may use the script for publicity or other events as deemed necessary by the producer and/or the director of the production. 5. Playwrights whose works are chosen for the production will be invited to attend the three performances and participate in a talk-back session with the actors and audience members after each show. 6. Alumni may not submit more than one (1) play for this year’s production. 7. Scripts must be emailed to Dr. Robin J. Boisseau at robin.boisseau@hamptonu.edu. 8. Deadline for submission of play scripts is January 25, 2019. 9. Playwrights will be informed of the decision of the committee by January 31, 2019.